Dr. Jorge Sousa, Engineer and inventor of the product, has dedicated most of his professional life to the research and development of asphalt mixtures with tire crumb rubber. For more than 30 years, he has worked in more than 50 countries and has been able to work with the most prestigious universities and technology centers. The development of the RARx, has been its major milestone, since it has been the real solution for the asphalt, being an additive of direct use in the plant, and that allows to manufacture asphalts with a high rubber content without any difficulty or extra cost for the asphalt company. This additive, made up of 60% of recycled tire crumb rubber, has shown in 2018, its first year of life, that it is a real solution for the road and for the sector. CIRTEC, thanks to RARx has revolutionized the asphalt sector both in Spain and in other countries such as Germany, Portugal, Indonesia, Mexico, etc. In 2018 about 2,000 tons of RARx have been placed on the market. CIRTEC, a company created by Valoriza Medioambiente and Composan Industrial, is the first company created under a single social purpose, which is to create technical solutions and services that make the circular economy real on the road. Under its main product, RARx, has developed other services, such as the manufacture of modified bitumen with tire crumb rubber in situ. For the circular economy to be possible, it is necessary to have companies that bet on technological solutions and innovation. In this sense, CIRTEC has shown that the circular economy is an opportunity, achieving in just one year to reuse some 400,000 equivalent used tires. This figure is a milestone if we take into account that in 2016 less than 300 tons of crumb rubber were consumed in Spain in all the Spanish sector. RARx and CIRTEC is an example of circular economy, and clearly shows that caring for the environment does not have to be at odds with the quality and competitiveness of asphalt works. At the signing of the agreement, there was an exceptional witness D. Juan Jose Potti, Executive President of ASEFMA. 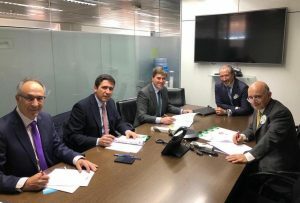 ASEFMA is the association of companies manufacturing Spanish Asphalt mixtures, a sector to which CIRTEC intends to provide a true service with its RARx additive. There is the circumstance that both VALORIZA MEDIOAMBIENTE and COMPOSAN INDUSTRIAL are companies associated with ASEFMA. The signing of this agreement is a demonstration that Spanish companies are once again at the forefront of environmental engineering and technology, as the agreement creates the basis of a global perspective project, which is committed to the circular economy, under the objective to give service with a quality product to a market sector as demanding in its technique as the road sector.